The grim decor in which peace between New Genesis and Apokolips will be decided in Mister Miracle #9. Scott Free is an escape artist. And a superhero. And the owner of the DC universe’s best T-shirt collection. But those are beside the point, which is that he’s known for escaping things. You could say he gets out of them, well... scott free. But this week’s Mister Miracle #9 might have given him, at last, a trap that could prevail over even his abilities. 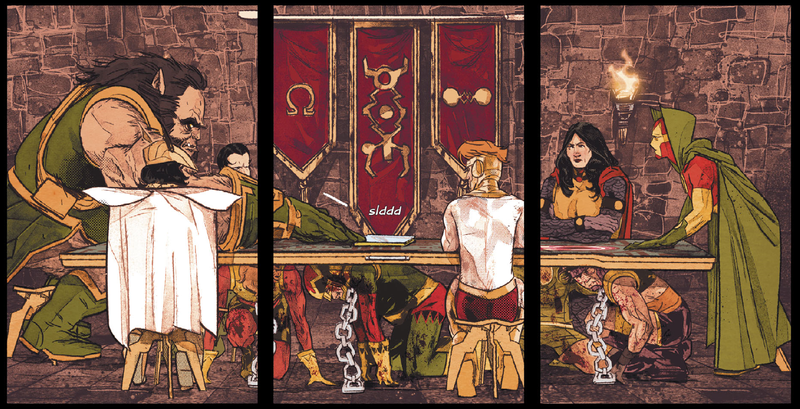 Ever since Tom King, Mitch Gerads, and Clayton Cowles’ Mister Miracle started, the background (and occasionally foreground) of Mister Miracle and Big Barda’s story has been consumed by an all-out war between New Genesis and Apokalips—a bloody, brutal conflict that began with the murder of the Highfather himself, and has seen Scott and Barda’s lives on Earth turned upside down in a cosmic clash between the banality of normality and the Kirby-esque weirdness of their godlike homes. But now that conflict is coming to an end, with Mister Miracle #9 focusing on peace treaty negotiations between Scott (now the Highfather, following the deaths of both his father and his half-brother Orion) and Kalibak in an attempt to reestablish an inevitably-temporary peace between the warring worlds. Like Mister Miracle at its very best, it’s a scenario that delights and horrifies in equal measures. This issue’s story contrasts the costumed drama of a peace negotiation between gods with the dark humor of treating these bizarre figures like average, normal people. Scott and the fancifully-dressed member of Darkseid’s elite, Kanto, go on bathroom breaks from negotiations and chat about the weather, or Da Vinci’s gay lover (and Kano’s attempts to hook up with the legendary maestro), while nonchalantly peeing down gigantic Apokaliptan pits onto traumatized prisoners below. A trivial discussion around which calendar format Scott and Kalibak are working from is played for laughs when the ever-dramatic Lightray leaps up from the meeting table to scream bloody vengeance for the death of Orion. The moment is given the same weight as a later one, where a furious Scott demands Apokaliptan forces follow prisoner exchange guidelines set forth by an external commission, causing a furious Kalibak to wrench one of the prisoners holding the table up from under it and smash his head into a wall. Shut the @&%# up, Lightray, indeed. It makes for an issue that is as tense as it is shockingly funny at times, itself perhaps a damning statement at our ability to find humor in the grimmest of moments. Scott and Kalibak’s negotiations are over the end of an awful conflict that’s cost the lives of untold numbers of people on each side, after all, so they carry an intense weight, even if we are invited at times to poke fun at the mundanity of the process. But it’s a scenario which also perfectly encapsulates everything that has made Mister Miracle so far one of the most gripping series on shelves right now—the interplay between the bleak and the beautiful, between the normality of life and the strangeness of superheroic gods. But ultimately, Mister Miracle is also a comic that is about watching Scott Free slowly unravel due to the sheer everything-ness of the events around him. Kalibak’s violent murder of a prisoner in the midst of negotiations prompts an immediately hard-edged response from Scott in turn, but the night after it happens he is curled up in bed, teeth-chattering in a state of distress. But it’s not even the general misery of a place like Apokalips that does Scott in this issue, it’s Darkseid himself. Or, more specifically, Darkseid’s demands. The negotiations Scott and Kalibak hashed out over days of debate are rejected in the issue’s climax, replaced with a new offer directly from the galactic conqueror himself: Apokalips withdraws all its forces and gives up the feared Anti-Life Equation, and submits to complete inspections from New Genesis officials. In exchange for giving up literally everything they could, Apokolips asks for just one thing of Mister Miracle and Big Barda: their newborn son, Jacob Free, given over to be raised as Darkseid’s own, just as Scott was as an infant. The visual distortion employed in panels associated with the sinister influence of Darkseid throughout Mister Miracle is one of the many things that makes this such a stunning book to read. It is a nightmare of a choice—what Darkseid offers is a peace that could last for decades, like the peace established when Highfather gave the young Scott up to Darkseid in exchange for raising Orion. But Scott, a man who’s spent most of this series slowly being broken by the stresses of his upbringing, would in exchange be damning his own son to the horrible life Highfather damned him to. Knowing what that’s done to him over the years since, knowing what he’s currently going through, could he even consider doing that to his only child? We’ll have to wait to find out. But it is perhaps only appropriate that Darkseid be the one to spring a trap that even his adoptive son could struggle to escape from.